Let C be a compact convex subset of 3-dimensional Euclidean space E(3) whose interior is non-empty and whose diameter is d. What is the largest volume that C can have if every subset of C that is a straight line segment of length d is a subset of the boundary of C (or-equivalently-if no chord of C that contains an interior point of C has length d)? It looks as though this maximum might be close to the volume of a right circular cone whose base radius is d/2 and whose height is ((3^(1/2))/2)*d. I am unable to say more. Perhaps there is no maximum volume-only a least upper bound. Although C is a convex body, it is not what would be called stricly convex. To keep things simple I am avoiding any discussion of higher dimensional versions of this question. I would suggest yet another larger set. Take two points $A$ and $B$ in the plane with $|AB|=d$. Let $S$ be the set of all points $X$ in this plane lying in one halfplane defined by $AB$ and satisfying $|XA|,|XB|\leq d$. 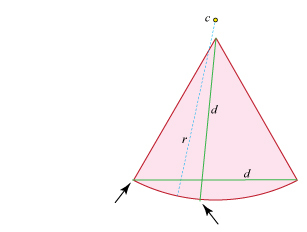 Then rotate $S$ around the perpendicular bisector of $AB$; you get the convex body containing your cone. Then, after smashing it a bit you get a desired set --- still of larger volume. (Arrows indicate segments of length $d$ that cannot fit.) If this is correct, the max volume can be approached but not achieved, as you suggest. 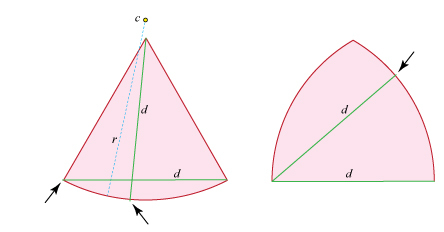 Do elongated convex objects all have long simple geodesics? What is the shape of the convex $n$ -gon which gives the maximum of a function?